How to Monitor Your Brand Mentions for Reputation Management? 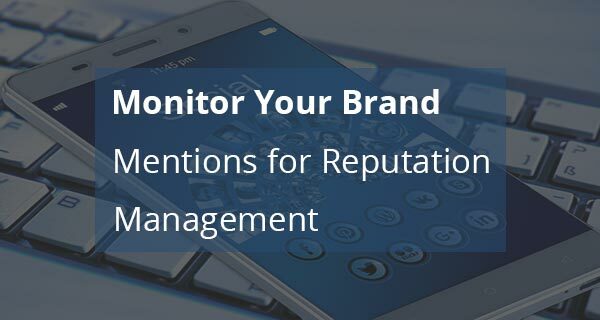 Blog » Online Reputation Management » How to Monitor Your Brand Mentions for Reputation Management? Do you have a brand that gets mentioned online? Do you want to know where those mentions coming from and on which platform your customers are mentioning you? In this post, I’m going to discuss some techniques to monitor a brand name for reputation management. You can monitor any mention of your brand name using different tools and practices. Why Do You Need to Monitor Brand Mentions? There are countless reasons to keep track of your brand and how people are reacting to the brand online. A good brand always cares about people, and if you are not going to care about them, they will start complaining in forms of negative reviews, complaints, and negative stories. Using a different set of tools and online reputation management techniques you can monitor any brand mention on different platforms, listen, track, and respond to brand mentions. If you are concerned with online reputation then you will also find this online reputation management guide quite useful. Here are some great tools to monitor a brand name. You can try out these tools and improve your brand reputation. It is one of the best tools to monitor your brand mentions in search results. I have used it for lots of clients reputation campaigns. It is quite easy to use and you can type any keyword that you want to monitor and set up alerts. As soon as some content get indexed in Google, this tool will send you a notification through email or however you would like to set it up. When you create an account and set up alerts on keywords, make sure to also check the notification settings. You can easily set up this tool within minutes and improve your brand Internet reputation. It is one of the best and free tools to monitor any brand mention on Twitter. By using it you can monitor any keyword mentioned and talk about on Twitter. No matter, if it is a small business which no one talks about. You would be amazed to know that people have mentioned you on Twitter, which you never knew about even though you monitor your Twitter notifications timely. I would highly recommend this tool to monitor Twitter mentions of any brand name. Another amazing social media monitoring tool. It can help you listen to the audience what are they talking about if they mention your brand name on many platforms including; Facebook, Instagram, Twitter, YouTube, and Google+. You can also use this tool to monitor a particular keyword or your competitors brand mention. It will provide you with a lot of useful information to find out your competitors weaknesses. In online reputation management, a brand must always keep an eye on what has been said by its customers behind their back. You can then improve, tackle those reviews, give incentives, discounts, etc… If you are a brand with a good following, then there are chances that people are going to mention your brand on the Internet in a positive or negative manner. When you instantly find out those mentions you can anytime counter them or if it’s good one shares them as a success story with your customers. Let me know what do you think of this strategy and what practices do you use to track brand mentions in search results. Also, if you need further help then you can check out some of my latest online reputation management tutorials here.